BRDC British F3 pairing Toby Sowery and Akhil Rabindra endured rocky weekends at Rockingham Motor Speedway on the May Day bank holiday. The difficult Corby circuit hosted rounds seven, eight and nine of the season, just two weeks after an excellent three rounds at Brands Hatch for the team. Last year's MABA finalist Sowery began the weekend at the top of the championship standings, with four podiums in the first six races of the season including a win at Brands Hatch. A difficult qualifying yielded only 13th place at the Speedway, though, which was converted into 14th place in race one having dropped back to 19th early on. A fighting drive through the field from row seven on the grid in race two saw Sowery up to eighth by the flag, before completing the top six in the third race. The spirited performance ensures he heads to Oulton Park in second place in the championship standings. Rabindra qualified in 16th place for the opener, three-tenths adrift of team-mate Sowery, and took 19th place. His best result of the weekend came in race two, picking up three places to claim 16th position. Race three ended in retirement for the Indian, leaving him 19th in the standings. 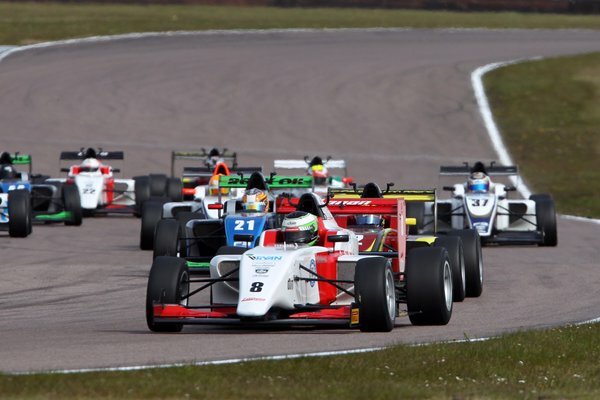 British F3 heads to Oulton Park next on May 28-30 for rounds 10, 11 and 12. For more information email graham@lananracing.com or call 07970 685498.